‘The Downton Golden Pippin is a most abundant bearer, and the fruit extremely well adapted for market; it is rather larger than the common Golden Pippin; skin nearly smooth; yellow, sprinkled with numerous specks; flesh yellowish, crisp, with a brisk, rich, sub-acid juice; specific gravity 10.79. Ripe in October and November, and will keep until Christmas’. Listed under Autumn Fruit. [FCM p.40/1845]. The fruit is fit for the press in the middle of November but will keep until the spring. Free-growing and highly productive tree. Developed by Thomas Knight. [HP]. ‘The tree is a strong, healthy, and vigorous grower, a most abundant bearer, and attains about the middle size. It may be grown as an open dwarf, and is well suited for espaliers. The fruit is also valuable for the cider it produces, the specific gravity of the juice being 1080. This excellent variety was raised by Thomas Andrew Knight, Esq., of Downton Castle, from the seed of the Isle of Wight Orange Pippin, impregnated with the pollen of the Golden Pippin, and the original tree is still in existence at Wormsley Grange, Herefordshire.’ [Hogg p.69/1851]. Figured in the Pomological Magazine [PM t.113/1830]. 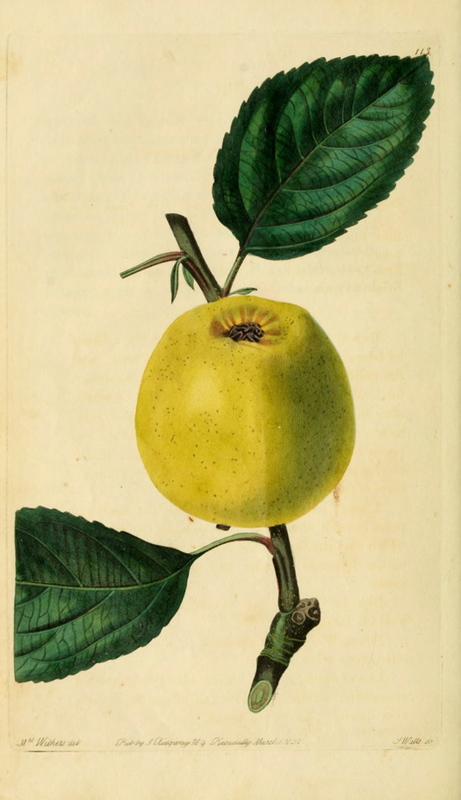 ‘Knight’s Golden Pippin: Small yellow fruit, excellent flavour, and a first rate bearer.’ [David Crichton. NSW Hort. Mag. vol.1 p60/1864]. This may refer to ‘Supreme Crab’, which see, rather than ‘Downton Pippin’. Listed in all catalogues [Apple no.4/1843]. There are two references to the quality of fruit in William Macarthur’s records. March-May. Middling, small tree. Very firm, acid fruit of little value here. [Notebook no.9, MP A2948]. February-May. Dessert fruit, very firm but acid. [Diary B, 1862, MP A2951].